At the recent Board of Fisheries (BOF) October work session in Anchorage, the Alaska Department of Fish and Game (ADFG) gave a standing room only 4-hour oral presentation titled Alaska Salmon Hatchery Reports: Research and Related Issues. The report covered fishery and management definitions, Alaska’s precautionary approach, update on the Alaska Hatchery Research Program, studies germane to Prince William Sound hatchery / wild salmon interactions, genetic effects, carrying capacity, review of literature, and identified research needs. Also provided to the BOF was a recently released Department written report titled Salmon Hatcheries in Alaska – A Review of the Implementation Plans, Permits and Policies Designed to Provide Protection for Wild Stocks. The takeaway message in both reports is that ADFG implements a precautionary approach in the formation and implementation of its hatchery salmon policies, in cooperation with private, non-profit hatcheries throughout Southcentral and Southeast Alaska. Both reports note that further research is necessary, however, as large scale hatchery salmon releases continue to raise concern for impacts to wild salmon stocks, and that the Department does not have a definitive answer whether hatchery fish negatively impact the productivity and sustainability of wild salmon. 5 Billion hatchery salmon are released into the North Pacific Ocean each year. 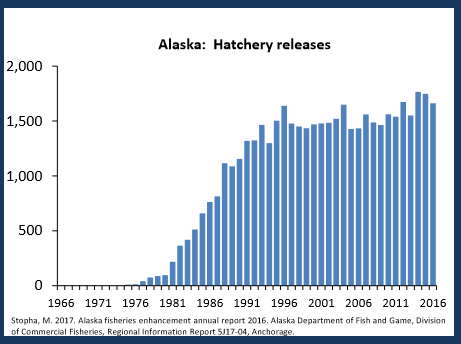 Alaska leads the international hatchery salmon releases into the North Pacific Ocean at 1.5 billion. Since the 1990’s, hatchery pink salmon make up the majority of pinks harvested in Prince William Sound. Between 600 and 700 million hatchery pink salmon are released each year. In both the written and oral reports to the BOF, ADFG omits a key study that documents the negative impact of hatchery pink salmon on wild sockeye salmon in Prince William Sound. The missing report ironically was produced in a collaborative project with fishery scientists not only from the Alaska Department of Fish and Game, but also the National Marine Fisheries Service, the School of Fisheries and Ocean Sciences at University of Alaska Fairbanks, the National Center for Ecological Analysis and Synthesis at the University of California Santa Barbara, the Farallon Institute for Advanced Ecosystem Research, the Kasitsna Bay Laboratory of the National Ocean Service, and the School of Aquatic and Fishery Sciences at the University of Washington. The research tests these specific hypotheses to see what is driving herring and salmon productivity in Prince William Sound. Of the salmon species, the authors found that the largest driver was the negative impact of adult pink salmon returns on sockeye salmon productivity. Sockeye salmon productivity vs. total hatchery pink salmon returns to PWS. The researchers found no evidence supporting a negative EVOS impact on herring, sockeye salmon, or pink salmon productivity. But they did find a negative impact of hatchery pink salmon on sockeye salmon in Prince William Sound. They report that all sockeye salmon stocks examined exhibited a downward trend in productivity with increasing PWS hatchery pink salmon returns. 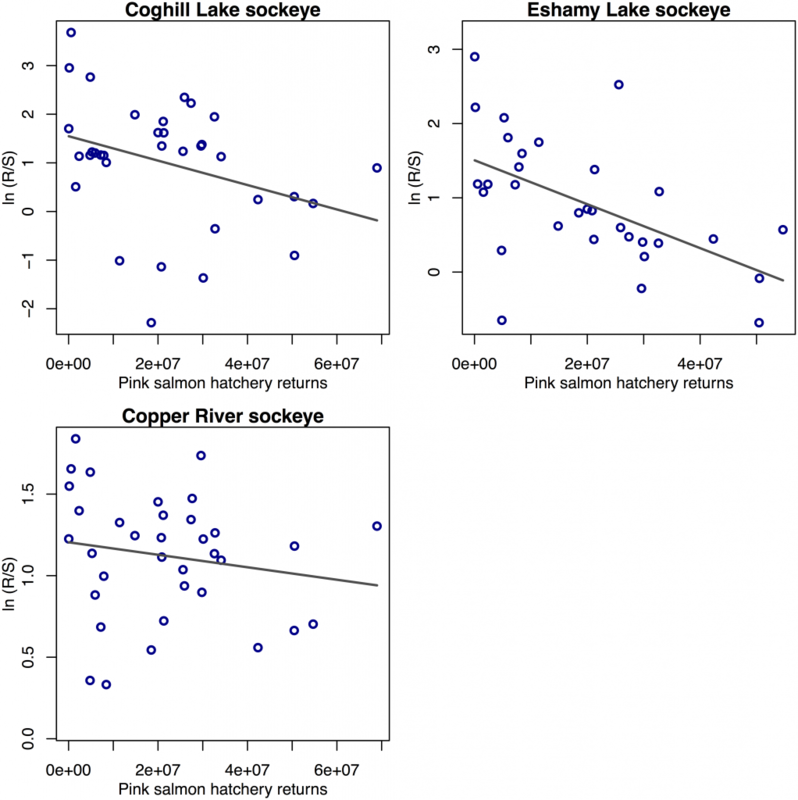 They note that while there was considerable variation in sockeye salmon productivity across the low- and mid-ranges of hatchery returns (0-30 million), productivity was particularly impacted at higher levels of hatchery returns. This finding matches up with other research that finds pink salmon are found to negatively affect sockeye salmon productivity and growth from British Columbia and Southeast Alaska, Bristol Bay, Kodiak, and Russia. They note that pink and sockeye salmon compete in the marine environment due to a high degree of similarity in diets, including similarities in diets of adult pink salmon and juvenile sockeye salmon. The analysis was designed specifically to test drivers in the nearshore environment, when the majority of juvenile sockeye salmon outmigrate from the nearshore environment as adult pink salmon are returning to spawn. Everyone can agree it is better to make decisions in the context of having the best available science. It is confusing that in both the written and oral reports to the BOF, ADFG omits this KEY research on the very topic under consideration. Especially in light of the fact that this exact research is the specific type of research ADFG identifies as the type of best available science needed to move forward on the issue. The question remains: is it wise to continue to expand the production of hatchery pink salmon in Prince William Sound, or is it better to hold at current levels until there is a better understanding of their impact on wild salmon? For whatever reason, the Department did not provide the BOF with the best available science on this issue. 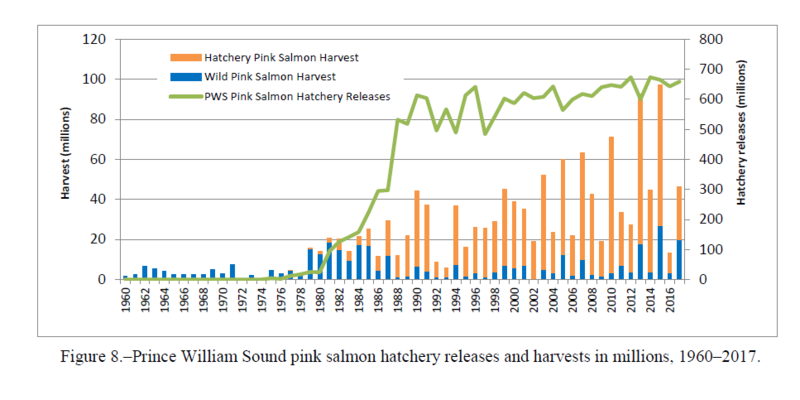 And in the context of an overall step-wise increase from 230 million to 300 million hatchery pink salmon production in one hatchery in PWS (about a 10 percent increase in the overall capacity of PWS hatchery pink salmon production), did the BOF act in a precautionary manner in taking no action when research indicates the impacts of PWS hatchery pink salmon are greatest on sockeye salmon at high levels of return (greater than 30 million)? Hatcheries are an important component of commercial fisheries in Alaska. It is not the intent of KRSA to harm that capacity. However, it is in everyone’s best long-term interests to maintain a precautionary approach when considering further expansion of hatchery production in light of its unknown impact on wild salmon stocks, especially in terms of wild salmon productivity. 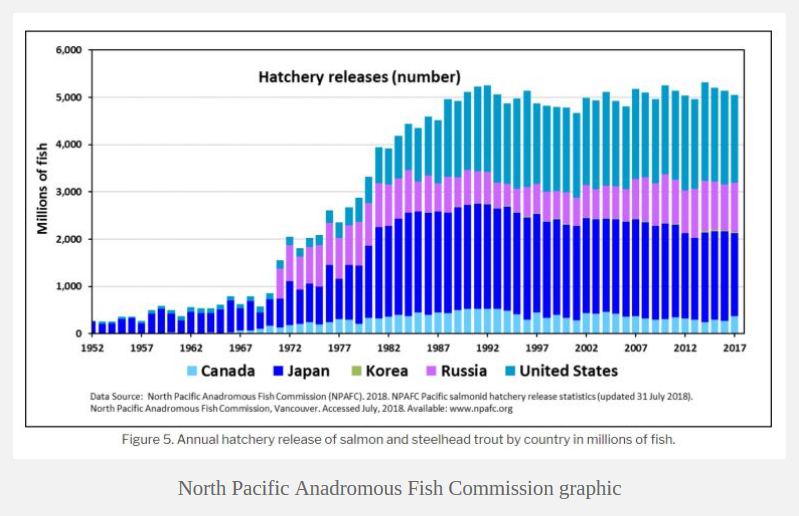 In light of the fact that PWS hatchery pink salmon harvests (not just returns) have exceeded 30 million in 4 of the last 8 years, more consideration may be needed on this topic by both the BOF and ADFG.